This piece represents an attempt to pick apart Doomsday Clock for a detailed exam of what Johns and Frank are doing. I’m stating up front that my efforts are going to be imperfect: other readers are going to catch things that I won’t, and vice-versa. (I note that Bleeding Cool caught the Howard Beale reference ahead of me; everything else in here, to the extent that it duplicates Bleeding Cool’s notes, is coincidental.) To the extent that anyone wants to collaborate, please drop observations in the comments and I may go back and add them later. The Cover: Up front, Frank is imitating the distinct art style of Watchmen. Dave Gibbons’ covers were always a close-up of something immediately on the page to follow, showing the focal point of the story but also making the cover a literal part of the drama. Here, Frank is showing something that should be obvious to the reader: it’s a crowd protesting Adrian “Ozymandias” Veidt, and very angrily. Watchmen ended with the door being opened to Adrian’s world-saving scheme being exposed; the cover, naturally, shows that’s what’s happened. Also, of note: “Doomsday Clock” has a few puns of significance. 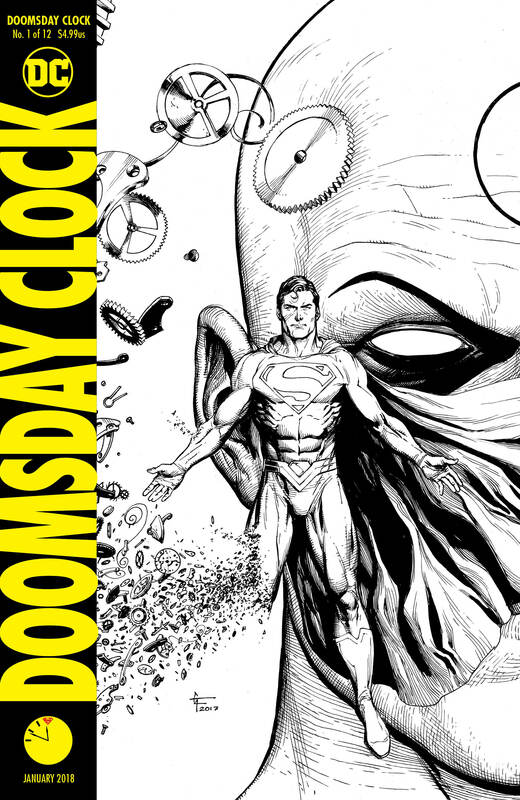 The story’s initials are “D.C.,” an adorable nod to the publisher which has now been around for 75 years; the “Doomsday Clock” itself references the pending threat of nuclear war, as well as the real-world measure by scientists of how close our world is to ending; and “Doomsday” is the monster who killed Superman. Whether he shows up in this series is another question, but…well, hang on. Page One: Unsurprisingly, Frank is following the trademark “nine panel grid” layout Gibbons used. Moreover, in the coming pages, it looks like Frank is imitating the actual layout used in the first issue of Watchmen. It’s not a precise imitation, but this page uses a three, three, and one layout, and sure enough, Gibbons’ first page was identical. Not every page is a precise duplication, but it looks like he’s at least trying. This issue is—apparently—set on November 22, 1992. Real world, George H.W. Bush was still president, but Bill Clinton was on his way in. Senator Bob Packwood had just been accused of molesting multiple women (that sounds familiar). The Cold War was over, and in the comic books, Superman had just died. Thematically, everyone is expecting that fact to tie in, but if that’s the case, this issue doesn’t show that yet. Of course, November 22, 1992 is also twenty-five years to the date from the release date of this issue (minus three minutes if your store is doing an 11:57 release on Tuesdsay). Also worth noting is that this is 29 years from the date of the Kennedy Assassination. An unlikely connection is that this could be a nod to the fact that in the Watchmen universe, the Comedian was implied to have killed Kennedy (which was debunked in Before Watchmen). A better connection might be that Kennedy’s death marked the fall of “Camelot,” the nickname for the “royalty” of the Kennedy family. Symbolically, Ozymandias is undergoing a similar fall. Here, we’re meeting Imitation Rorschach through his journaled narration. We don’t find out who he is in this issue, but he certainly has Rorchach’s narration down pat. In one page, “Rorschach” gives us the overview of the world since Veidt blew up Manhattan in 1985. Despite being set in 1992, the Watchmen Earth seems to have devolved into our own: liberals vs. conservatives out for each other’s blood, violent street protests, and a distrust of anything. “Maybe we should let the world burn” is pretty pessimistic, and darkly echoes Alfred’s famous line in The Dark Knight. Page Two: A brick goes through a window. In the original, this is right around where we had the flashback to the Comedian going through glass. This is likely an intentional play on things: Veidt’s scheme started with someone going out a window; his fall has something coming in one. Page Three: Veidt’s office, now empty, is being stormed by the masses. Slightly mirroring page 18 of Watchmen #1, we see a close-up of Vedit’s desk with a newspaper headline “THE BIG LIE” (a likely reference to Hitler’s position that a gross enough deception cannot be disbelieve). In the original, it was a newspaper warning that the real-world “Doomsday Clock” was moving closer to midnight due to the impending war between the Soviet Union and the United States. With Veidt’s “alien invasion” hoax exposed, the U.S. and Russia are headed back to war. Note that Veidt’s action figures are toppled over, symbolically imitating his statue in the famous “Ozymandias” poem where the real figure’s monument lay fallen. The final panel shows the invasion of Veidt’s arctic hideaway, complete with the long-dead palm trees from Watchmen #11. Page Four: It’s amusing to see pharmaceutical ads interspersed with news broadcasts announcing the end of the world, because advertisers never stop. Some of the news stations announce that they’ve been running for 27, 41, and 52 years. “27” is the issue of Detective Comics where Batman first appeared; “52” is DC’s favorite number. I’m not sure about “41,” but the other two numbers have to be an intentional wink-nod. (For what it’s worth, issue #41 of the current Action Comics series began the “Truth” storyline, so who knows.) The “Howard” screaming over the television broadcast is apparently a reference to the famous Howard Beale rant in the film Network. The invaders discover Veidt’s famous television room where he saw the world come to peace back in 1985. They also discover another room which will become apparent to us at the moment. However, the zoom-in on the x-ray resembles Veidt’s attempted murder of Doctor Manhattan in Watchmen #12, in which Manhattan momentarily looked like an x-ray. Page Five: William F. Buckley, Jr. is the real-world founder of National Review. He died in 2008. In Watchmen’s 1992, he’s still alive, and is apparently a White House spokesperson. Although this positioning is a little odd: later on, we’ll learn that Robert Redford is the U.S. President, as was joked at the end of Watchmen #12. Redford is pretty liberal; his positioning as the President is a liberal counterpoint to the real-world Ronald Reagan (another “RR” actor) becoming President. Page Six: Enter Rorschach, or whoever this is. This is exactly where he appeared in Watchmen #1 as well, in a very similar pose. The title, “That Annihilated Place,” is from Horace Smith’s version of the “Ozymandias” poem which he wrote in competition with Percy Shelly’s version. Shelly’s is the more famous edition. I hope that’s not Johns poking fun at himself, with Moore’s Watchmen likely to be more famous than Doomsday Clock in the future. Page Seven: Rorschach isn’t quite all there, suggesting this is not Walter Kovacs. That should be obvious, because Kovacs was atomized in Watchmen #12. There’s some clear Rorschach mirror-image play in the numerology here between cell 13 and cell 31. Also, “13” is a number that you never reach on a Doomsday Clock, the idea being that “12” equals death. Page Eight: It’s been awhile since we’ve lived under a serious threat of nuclear war, so today’s kids, who didn’t grow up in the Cold War, may not recognize this scene. Yeah, those are nuclear military technicians turning keys and getting ready to launch the bombs. If nuclear war could be called a “risk” in Watchmen, here it’s downright about to happen. Page Nine: Introduction of Erika Manson, the Marionette. Her name could be a reference to Charles Manson, who committed murders in 1969 and was sentenced to death in 1971. Manson never made it to his execution after four plus decades, and died just this week, coincidentally. Of course, Watchmen tended to heavily deal in real-world figures, so it’d be strange if the real Manson were completely displaced by a woman, much less one a lot younger than him. Anyway, as has been pointed out on other sites, Marionette is apparently a Watchmen analogue of Jewlee, a Charlton villain now owned by DC (as are all the other Charlton characters, who have analogues in Watchmen). We’ll meet her husband Mime (“Punch”) in a few pages. Rorschach makes clear that he’s not Walter Kovacs, as he removes his glove to reveal that he’s black. Whether this is someone we’ve met, I don’t know. The two most prominent black male characters in Watchmen (Doctor Malcom Long and Bernie the comic-reading kid) were both killed in issue #11. However, he’s got substantial knowledge of the original Rorschach, since he seems to be up on his history with Marionette. Page Eleven: Rorschach has regrets about “family,” apparently. Who is this guy? Based on a few clues in this issue, I had a strong hunch that Rorschach is Batman in disguise. Except that he’s black. Unless that’s a cover too, but I don’t think anyone wants to see Batman in blackface, and disguising himself in an alternate universe doesn’t make any sense if there is no Bruce Wayne here. One of the reasons I thought Rorschach might be Batman is that Punch and Jewlee, the “real” versions of Mime and Marionette, appeared last year in Tom King’s Batman, also in a prison-break story. This feels like too weird of a coincidence, but maybe that’s all it is. Page Twelve: Meet the Mime (“Punch”). What’s very weird is that with Frank’s art, he looks a lot like Superman here. This is a passing coincidence, because he does look different on other pages, and he certainly doesn’t act like Clark Kent. Page Fourteen: Just an observation here: the Mime’s “power,” if any, is to fake being an ineffective villain and then to very viscerally kill his opponents. This scene is pretty bleak and gut-wrenching, the kind of thing that works in Watchmen and doesn’t work in the DC Universe. Even the Joker’s worst offenses—Alan Moore stories notwithstanding—tend to be extremely cartoonish. This further illustrates just how split the Watchmen and DC worlds are. Page Fifteeen: “And don’t touch hat. Touch again and….” Why doesn’t Rorschach want his hat touched? Is this his equivalent of not touching Superman’s cape? It’s this dialogue which suggested to me that Rorschach is actually Batman and maybe there’s ears under the hat…but again, he’s black. Oh, and he mentioned stabbing someone earlier, and Batman definitely doesn’t use Rorschach techniques. Page Sixteen: Imaginary weapons used by a mime. Yes, Mime does have problems. Well done, Geoff Johns. Page Seventeen: More parallelism with the original Watchmen: on this page, Gibbons was showing us Adrian Veidt’s tower in the first panel. Here, Frank shows us the prison tower. It’s not clear if there’s intentional symbolism here or if Frank is just going to be cute. (To be fair, he did a precise imitation of Rorschach’s death in DC Rebirth #1.) I can guarantee that bloggers will be making these panel-by-panel comparisons in the months to come. Rorschach is apparently living out of his car, and he doesn’t trust the electric models which exist in the Watchmen universe. Is this another clue to who he is? Page Eighteen: New York is under mandatory evacuation given that it’s an obvious target in a nuclear exchange. We get a glimpse of the familiar Gunga Diner which appeared throughout Watchmen. Panel three apparently confirms that Robert Redford was elected President since people are regretting voting for him. Page Nineteen: How does Rorschach know that a mime is holding a pretend gun to his head? Again, this is a very Batman kind of move, but there’s no way he can be Batman. Page Twenty-Two: We’re in the Nite-Owl’s lair, apparently long-abandoned since those final issues of Watchmen. What’s interesting is that Dan Dreiberg cleared out of the place when the police raided it in Watchmen #8, and it seemed unlikely he’d be coming back. His ship, “Archie,” crashed in the Arctic near Ozymandias’ fortress. Apparently he recovered it and took it back, although returning to his base when the police knew about it seems like a bad move. Rorschach looks like he’s…pining?…at the sight of Archie’s steering column. The first Rorschach and Nite Owl did bond some (as best Rorschach could) during their flight to Veidt’s fortress, so is he remembering that somehow? But we otherwise have no clue where Nite-Owl and Silk Spectre are now after they went into hiding in Watchmen #12. Page Twenty-Three: Enter Adrian Veidt, Ozymandias, still alive despite the angry mobs. He’s carrying a kitten version of Bubasits, his mutant lynx who died in the arctic fortress. Great, a Doomsday Clock merchandising opportunity! Anyway, we learn here that Veidt only wanted Rorschach to retrieve Marionette and not Mime. Why? That’ll have to be clarified in a future issue. Page Twenty-Four: Veidt remarks that this version of Rorschach is a little…nicer?…than Walter Kovacs. He specifically references that Kovacs was “uncompromising,” as illustrated in his need to expose Veidt’s crimes even if it would plunge the world back into war. This Rorschach, apparently, isn’t quite like that, despite his insistence. Page Twenty-Five: That x-ray back on page four turns out to be a tumor in Veidt’s head, and that he’s dying of cancer. Ironic, since Veidt’s agents gave several people close to Doctor Manhattan cancer in an effort to scare him off the planet. Did Veidt accidentally do this to himself, like when he attempted to atomize Doctor Manhattan in Watchmen #12? Nonetheless, it’s ironic that Veidt’s tumor is an off-center circle in his head, a skewed version of the perfect circle on Doctor Manhattan’s brow. Page Twenty-Six: “…and it’s spreading,” as we see New York in flames due to riots caused by Veidt himself. So yeah, Veidt has actual cancer, but he’s also a symbolic, moral cancer. Anyway, Vedit sees his mission—his, Rorschach’s, and for some reason, Marionette’s—as finding Doctor Manhattan, the only person who can save the world. But where is he? Page Twenty-Seven: Cut to the much more idyllic DC Universe and Metropolis, considerably calmer than Watchmen’s New York City. Superman has a copy of Walden Two by B.F. Skinner on his nightstand. Skinner was a behavioral psychologist, and the novel rejected free will in favor of the idea that man was simply responding to outside stimulus. Funny enough, the absence of free will was a recurrent theme in Watchmen, with Doctor Manhattan believing that the universe was preordained due to his fourth-dimensional perceptions, and Veidt believing he could manipulate the best of all outcomes. It’s odd to think that the optimistic Clark Kent would be reading this book, but hey, symbolism. This is probably indicative of the fact that Manhattan has been manipulating the environment of the DC Universe since at least 2011 and the New 52 reboot. It’s been noted elsewhere that Clark sleeping with Lois in this scene might parallel Dan Dreiberg’s sleepless nights with Laurie Jupiter in Watchmen #7. Indeed, Clark is about to have a nightmare, though one different from Dreiberg’s. Page Twenty-Eight: Watchmen almost always used a nine-panel grid, or some variant thereof. This sequence intentionally uses twelve panels. Why? This choice has to be intentional. Perhaps, in keeping in the theme of the series, twelve represents destruction, since the bombs fall at midnight. Indeed, something bad is about to happen on the next page. Page Twenty-Nine: Back to the nine-panel grid—maybe this is the Watchmen universe intruding on DC? Anyway, seen here is the death of the Kents in the New 52 version of DC Comics. There’s been some question as to how the Kents died in the current DC timeline, although Grant Morrison’s run on Action Comics indicated they were killed in a car crash with a drunk driver. Until this point, it’s been otherwise unclear how the Kents died in the current DC timeline, particularly since Superman’s history was altered again in “Superman Reborn.” But the car crash seems to have stuck here, and we’re actually seeing the scene for the first time in detail. The question is, how is Clark seeing this in his dream? He wasn’t there. Page Thirty: Frank closes once again imitating the final page of Watchmen #1. That page ended with a zoom-and-pull-out camera view of Laurie and Dan; this page ends with the same style, only with Lois and Clark. Clark reveals here that this is the first nightmare he’s ever had—which seems unlikely in 75 years of DC history, but we’ll have to take Geoff Johns’ word for it. The chapter ends with the full quote from the issue’s title, just as Moore did in Watchmen #1. Page Thirty-One: The issue is dedicated to Len Wein, the legendary comics writer who edited the original Watchmen series. He died earlier this year. Supplemental Pages: Moore and Gibbons had an addition to every issue of Watchmen with a sampling of some “real” documents from their universe which gave additional insights and clues to the story. They weren’t critical reading, but in the grander context of the story, they helped. These pages aren’t quite so thick, and they aren’t even full reads as Moore’s “book excerpts” were. Here, we get a cover page from “The New York Gazette,” dated November 5, 1992. Specifically, it’s the paper we saw on Veidt’s desk earlier this issue, which exposed his role in the destruction of New York in the original series. For cuteness, note the weather report in the upper right: High 52 (DC’s favorite number); low 38 (Superman debuted in 1938). I don’t know if “High 50” and “Low 55” have any significance (Superman proposed to Lois in Superman #50, and the old Superman TV show debuted in 1955, so maybe? ), but “high 75” could be a nod to Superman #75, released November 1992, where Doomsday killed him. Also, a high of 75 in November is crazy. Two days earlier, Bill Clinton won the Presidency in our timeline. Who won in the Watchmen universe? Redford again? The next two-page spread is some souvenirs from the Watchmen world of 1992. What these say is hard to tell at the moment, but we have: an article about the failure of the world’s nuclear disarmament efforts following Veidt’s exposure; a news story on the murder of Seymour, the staffer at The New Frontiersman who found Rorschach’s journal (it’s mentioned that the journal is still missing, and preview pages show Batman reading it); an advertisement for a six-in-one plier set from a store called “Dad’s” (the theme of fathers has been recurrent in DC Rebirth); an obituary for Byron Lewis, also known as Mothman, one of the Golden Age Minutemen; an ad for Schrodinger’s Watch Repair (a joke so obvious that it’s neither dead nor alive); and a menu from Morning Joe’s restaurant, where Rorschach mentioned eating back on page seven. The “Schrodinger’s Cat” reference makes for a possible reference to the state of DC Comics’ history. Of late, DC’s position seems to be that “it all happened” even when none of it did. That is, DC’s prior histories remain intact even when the timeline reboots. This was evidenced in “The Button” when Batman and the Flash went into the timestream and witnessed the original origin of the Justice League, even though they never experienced those events in the current timeline. And that’s all for the hidden clues in this issue. If you have more, please post them in the comments!